It was expected to be the closest election result in recent years but ended in a runaway success for the winner. A majority of almost 5,000 voters helped defending MP Amber Rudd remain in Parliament for another five years. Despite the near 4am result call and not a whisper of indication as to who had won, the results were a definitive yes to another term of Conservatism. And for Ms Rudd it was the evidence of progress which helped her to a convincing win more than doubling her majority from 2010’s general election results. 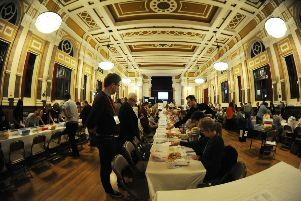 Ms Rudd polled 22,686 votes, Labour’s Sarah Owen 17,890, UKIP’s Andrew Michael 6,786, Green candidate Jake Bowers 1,951 and Nick Perry finished with 1,614 representing the Lib Dems. After addressing the hall at Horntye Park Sports Complex after the declaration, Ms Rudd said: “I asked the electorate to look at the evidence. “We have made great progress in Hastings. Unemployment is down and the A21 is being dualled (Pembury Bypass). I want jobs for the young. “The most important thing is I said to the electorate we will continue to do this. Mr Michael said he was pleased with his result and Mr Bowers said it had been a good night for the Greens and he had finished in fourth place as predicted.